Another 300 prospective jurors for the Michael Jackson child molestation trial were to be processed Tuesday, followed by 150 on Wednesday. Day Two of jury selection will be a lot like Day One, reports CBS News Correspondent Steve Futterman. Again, the prospects will be told that the entire trial could last six months. The judge will then listen to those who feel they cannot serve since it would be a hardship. The pop star was in court for the beginning of jury selection, reports CBS News Correspondent Vince Gonzales. "As the potential jurors came in, Jackson, his four attorneys and his jury consultant all stood. Jackson clasped his hands in front of him and flashed a broad smile at the jurors as they came in," Gonazales said. Jackson was dressed in an all-white suit and a jewel-trimmed vest and belt. 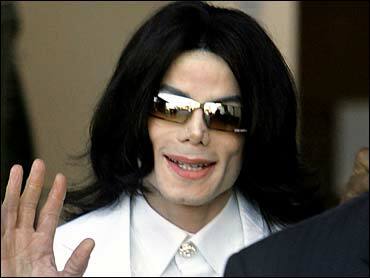 "Some of the jurors studiously avoided glancing at Jackson as they came in," reports Gonzales. "Others craned their necks to get a good look at him. Once all the jurors were in and seated though, there was a moment in which it seemed that all eyes were on Jackson. They were studying him. You could have heard a pin drop. Then the judge came in and the process began." The singer, his lawyers, and prosecutors remained silent as Judge Rodney S. Melville questioned the prospects about their willingness to serve. By the end of the day, Melville had listened to 138 people ask to be excused, but the only person he dismissed immediately was a woman who was eight months pregnant. "That's OK, first one that got deferred," the judge said to applause. Those not immediately excused were to fill out questionnaires to be studied by attorneys before individual questioning later. Besides 12 jurors, Melville wants eight alternates. Outside, hundreds of fans from around the world shouted their support, some dressed like the superstar. There also was a contingent of people who came to support the alleged victim. Security fences kept order, unlike a year ago at Jackson's arraignment when 1,500 or more watched the pop star dance on an SUV and surged after his vehicle as he motored away. Holding signs that read, "Dear God, Please Give Michael Justice" and "Smooth But Not a Smooth Criminal," fans sang along with a Jackson song that derides the prosecutor in the case as a "cold man." The target of their ire, Santa Barbara County District Attorney Tom Sneddon, did not come to court. A deputy represented the prosecution. Jackson, 46, is charged with molesting a teenage boy and plying him with alcohol at his Neverland Ranch. He also is accused of conspiring to hold the boy and his family captive. Early Sunday, Jackson issued a court-approved video statement on his Web site, proclaiming his innocence and predicting he would be acquitted. "No other defendant in American history has had to bring into trial all the baggage that Jackson brings into this trial," says CBSNews.com Legal Analyst Andrew Cohen. Melville told both groups of prospective jurors that they might have to serve for about six months, and that it was an important duty. "Most of us have relatives who have fought and died to protect this system," Melville said. "Freedom is not free. Jury duty is part of the cost of freedom." The jury pool was predominantly white. About a quarter appeared to be Hispanic, and only a few were black. One of the black men in the pool told the judge he was unemployed and "six months will affect my future. I think I should worry about myself and not the defendant." A white man said during a stint in jail he got into a dispute between a black prisoner and a white prisoner and had been branded a racist, even though he was not. Another man who had been convicted of an undisclosed crime said he was on an electronic monitor and confined to his home. Melville ordered the man to remain in the jury pool and said he would inform those monitoring him. Another prospect said he is chief launch coordinator at nearby Vandenberg Air Force Base. He said he has two launches in the near future and can't take time off to be a juror. Many of the prospective panelists reflected the small-town feel of northern Santa Barbara County, a Central California region known for wine, agriculture, and Jackson's Neverland Ranch. One woman said she could get a medical excuse from her doctor across the street. A few said they have friends who worked at Neverland. One woman said that at 75, she was "just too old." "You don't look a day over 60," the judge replied. The woman said she was willing to serve if she had to, but noted she had "a multitude of illnesses."